Break the digestives into the bowl of a processor, add the butter and a 15ml tablespoon of Nutella, and blitz until it starts to clump. Add 25g/3 tablespoons of the hazelnuts and continue to pulse until you have a damp, sandy mixture. Tip into a 23cm/9inch round springform and press into the base either using your hands or the back of a spoon. Place in the fridge to chill. 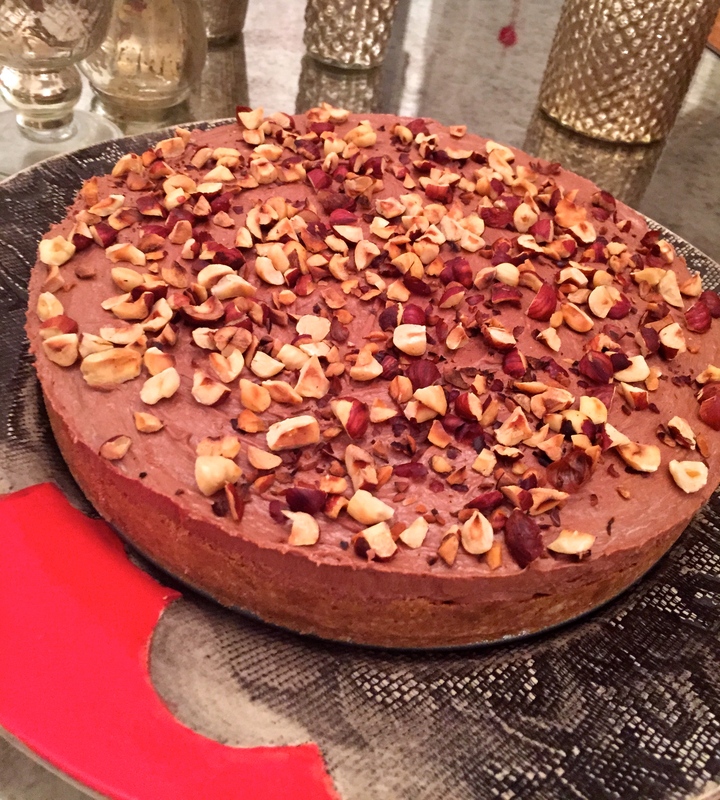 Beat the cream cheese and icing sugar until smooth and then add the remaining Nutella to the cream cheese mixture, and continue beating until combined. 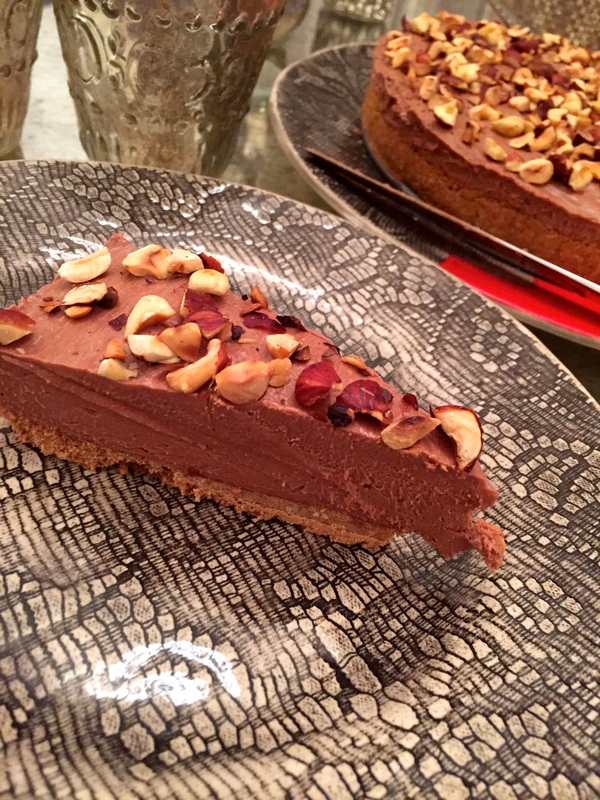 Take the springform out of the fridge and carefully smooth the Nutella mixture over the base. Scatter the remaining chopped hazelnuts on top to cover and place the tin in the fridge for at least four hours or overnight. Serve straight from the fridge for best results. I was really missing the tropical weather of Australia and India and craved mangoes mid New York winter. I decided I had to have a mango cheesecake there and then. I ended up using a tin of indian kesar mango pulp as its the only semi decent mango pulp I could get this time of year. If you make this try and use quality fresh ripe mangoes ( the best are from Oz or India), you would achieve much brighter flavors than my tinned mango could give. Will have to try this again in summer when I can get my hands on some decent mangoes bursting full of flavor! Grease a 6cm-deep, 20cm round springform pan. Line base and side with baking paper. Place biscuits in food processor. Process until finely chopped. Add butter. Process until combined. Press biscuit mixture evenly over base of prepared pan. Place pan in fridge. 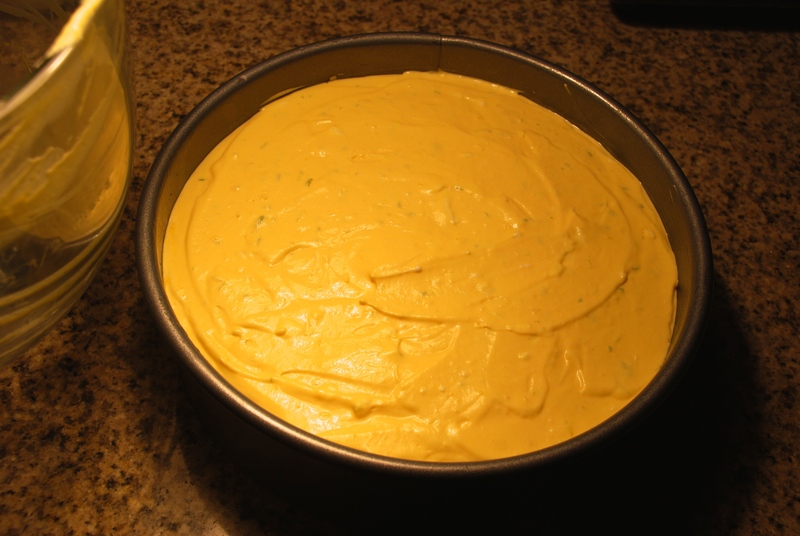 Using an electric mixer, beat cream cheese until smooth. Add sugar and lime rind. Beat for 2 minutes. Add cream. Beat for 5 minutes or until mixture is thick. Spoon into prepared pan. 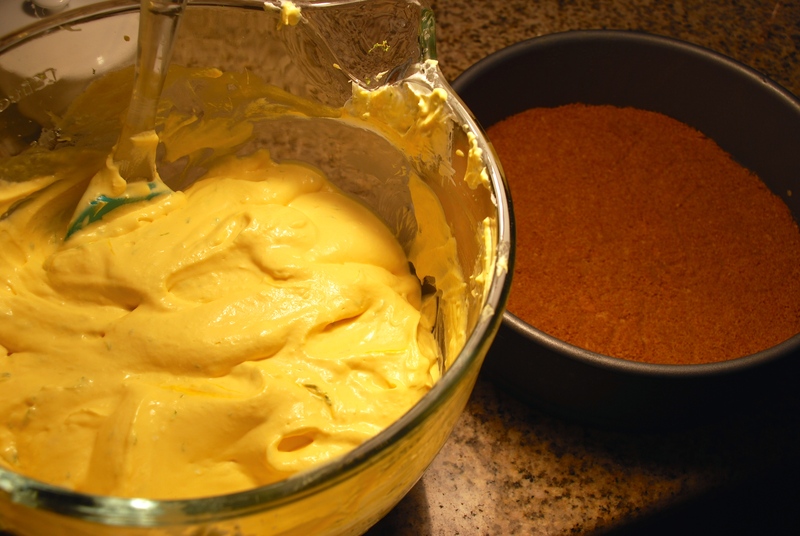 Place mango in a food processor. Process until smooth. 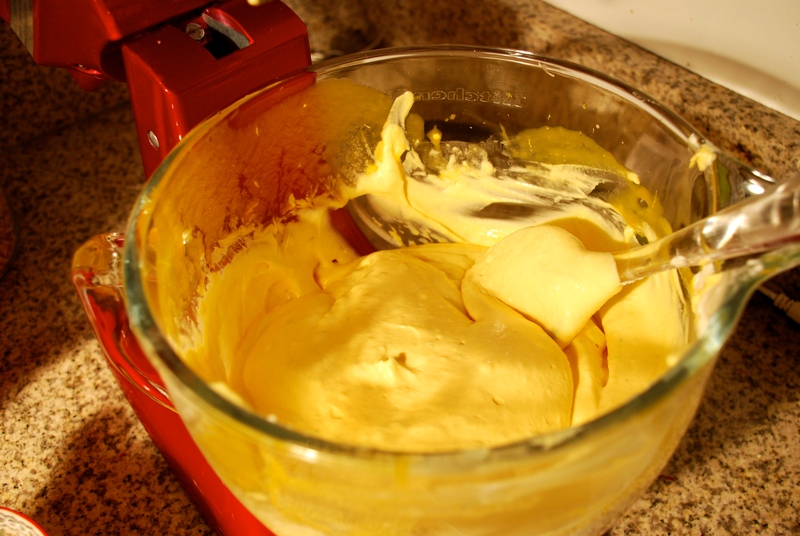 Fold mango through cream cheese mixture. Add the dissolved cooled gelatin to this mixture and mix well. Pour over the crust getting rid of air bubbles and smooth over the top. Cover with plastic wrap. Place in the fridge overnight or until firm. Remove cheesecake to a plate. 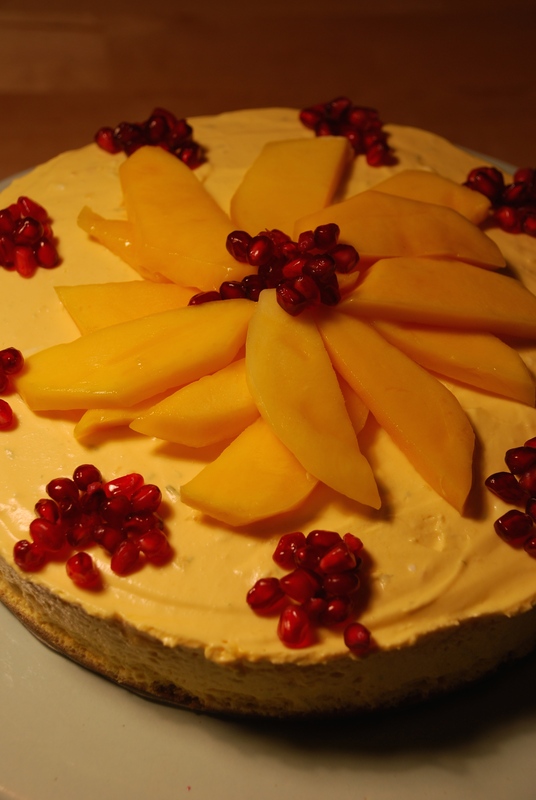 Top with mango slices and pomegranate for decoration if you like. Serve.